Here is an ideal project for someone more industrious than me to take on (see my offers on other pages), attempting perhaps to do what Rakauskas and colleagues did in Europe. For those of you who don’t know, Bursaphis is a group of apparently related species that have host plant ties to Ribes and Onagraceae. One major morphological feature they share is usually 6 or more accessory setae on the URS. One species that arguably should then belong in subgenus Bursaphis, but that so far is not placed there, is Aphis agastachyos Hille Ris Lambers. This species lives in the same habitats as some Bursaphis, and has the extra setae on the URS, but it is monoecious on Agastache (Lamiaceae; I have collected the fundatrix). The latter host association seems to bring pause when others have sorted Aphis into the few subgenera that seem like natural groupings. Complicating this picture a fair bit was the discovery in 2016 and 2017 of a very typical-looking Aphis (Bursaphis) living on Monardella odoratissima (Lamiaceae) in the mountains of southern Oregon and northern California. It was very abundant at a favorite collecting site in the Warner Mountains in September of 2017, where I found oviparae and males together with abundant apterous and alate viviparae. Personally, I think the conception of Bursaphis needs to be expanded to include these two species feeding on mints. Here is some of what I have seen or know about Bursaphis in western North America. species). It has some features that seem to be diagnostic, but I cannot yet be sure whether the features I see apply to one or more species. The features I focus on are the short URS, short siphunculi, long narrow cauda, and short tarsi with imbrications on tarsal II. The long cauda feature is less obvious in alate viviparae and males (which are alate). I was able to study the full life cycle of this species near my house in the near-desert climate of central Washington. In that situation E. paniculatum is one of the few herbs that grows throughout the year from spring through fall. 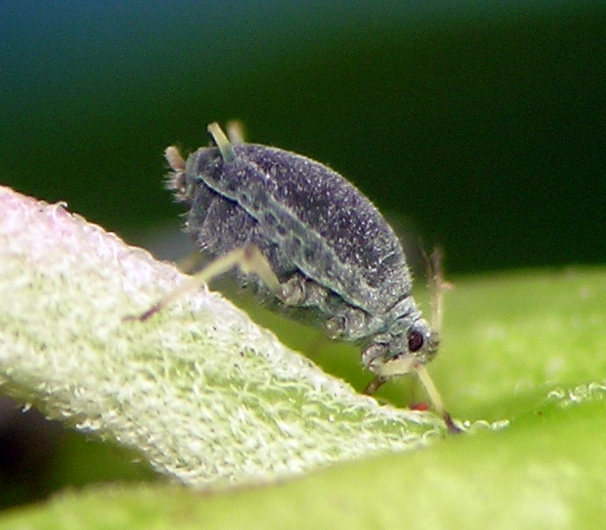 As with many aphids that are monoecious on herbs, fundatrices are found only in microhabitats where the season was favorable the fall previous. This often means disturbed soils in drainages and similar where competition from other plants is relatively low. 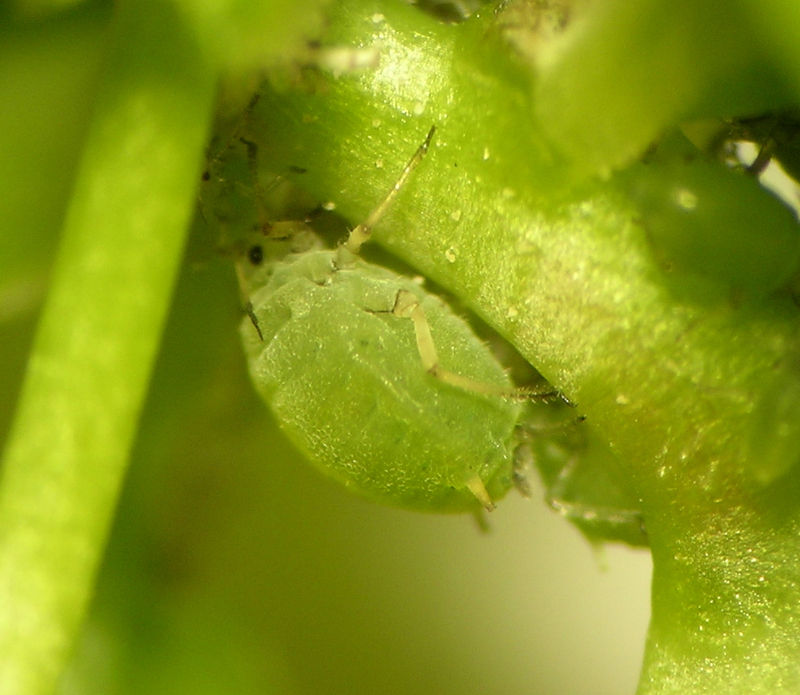 I routinely found this aphid in early spring on small plants (less than 5cm). It causes a moderate twisting and curling of the apical growth, living among those curled leaves. It is often heavily affected by parasitoids, and is rarely if ever tended by ants. This species lives all year on its Epilobium host(s). 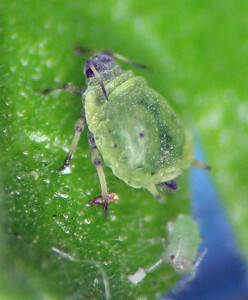 The real problem with this aphid is the question whether all the aphids I think might be one species are in fact two or more species. For example, I have a couple samples from unidentified Epilobium that tend toward smooth tarsi. I also have samples in fall from populations that seem to be producing all alate viviparae and alate males at a time when I would expect to see oviparae developing. 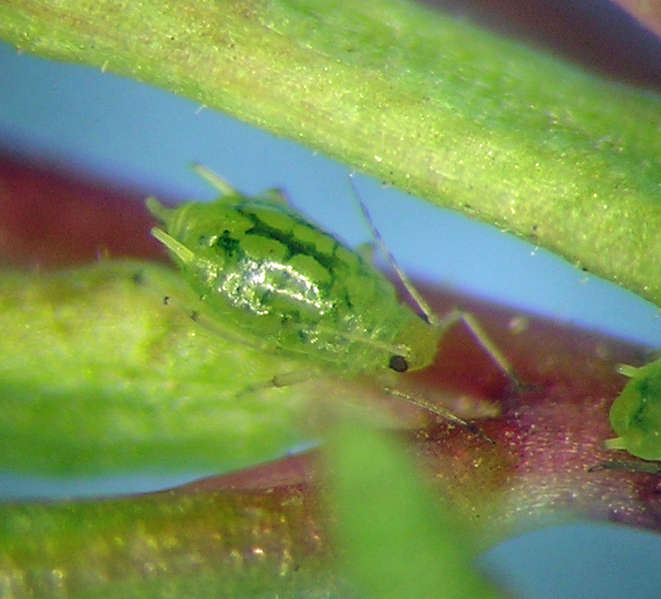 A sample or two from what I think was E. paniculatum seem to be larger aphids with longer siphunculi and of a different overall color and way of living on the plants. My guess on all of this is that there are a few to several species in different habitats or host plant species across the West that have the short URS and shortish siphunculi and longish cauda. In 2019 I was able to collect specimens in a single site on both Ribes cereum, alate viviparae emigrating, and on Epilobium paniculatum, alate viviparae immigrating. This indicates that there is a monoecious species on E. paniculatum in central Washington and elsewhere plus a heteroecious species on Ribes cereum and E. paniculatum in southern Oregon (and probably elsewhere). I continue to collect the group wherever I go, and someday may have enough material to sort things out. Here is an Aphis (Bursaphis) I’ve seen a couple times, living on what I think is Epilobium minutum next to a burned slash pile in the forest. This kind of thing is another complication to my Bursaphis picture. living on both Ribes cereum and Ribes aureum. I have a hunch that the specimens migrating to semi aquatic herbs are leaving R. aureum, but based on my morphological study I have not been able to rule out the possibility that there is one species living on both Ribes species that migrates to these herbs. It seems fairly certain that there is a species monoecious on Ribes cereum; the tougher question for me was whether there is one or two heteroecious species on the Ribes. 3. The previous two problems I have been able to study a fair bit. Aphis (Bursaphis) fundatrix on Ribes aureum in central Washington. The much trickier thing is all the Bursaphis one finds on Ribes and Onagraceae in the mountains, sometimes in very extreme environments and on rare or infrequent host plants. 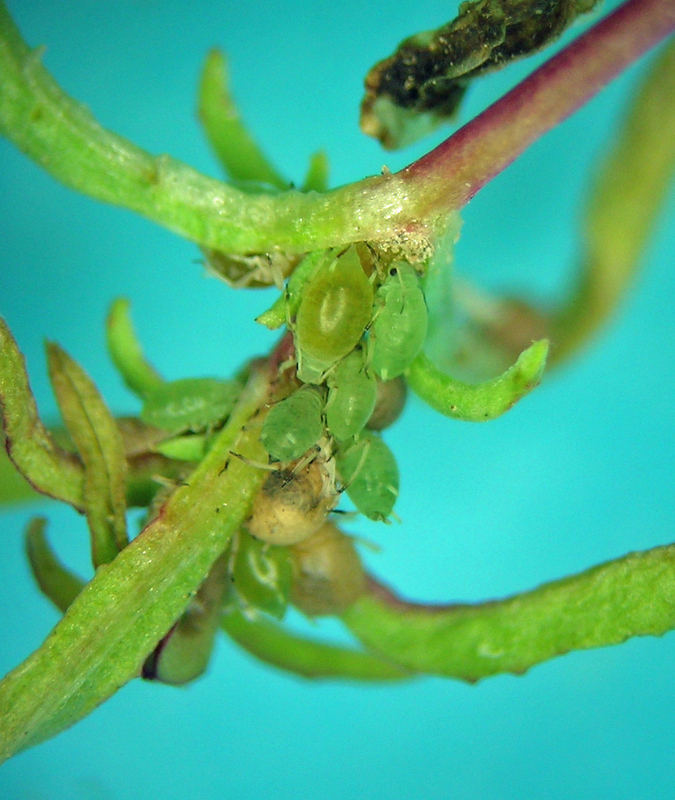 These aphids often look more or less the same in many places and on many plants. But, knowing how aphids can speciate on host plants, it is possible that there are in fact many species involved across the West. Much collecting and probably molecular work would be required to work it out. Anyone out there with a big travel budget and a Ph.D. student with about 6 years of funding?? This is one of the only Bursaphis species that I identify to species with reasonable confidence. It is understood to be heteroecious between Ribes and Epilobium angustifolium (a.k.a. fireweed). It is distinctive among other Bursaphis in North America because of its long wavy hairs on the antennae. So far I have samples from British Columbia, Washington, Oregon, Idaho, Montana, Colorado, and Quebec. Aphis (Bursaphis) varians from the Cascade Mountains in Washington.